Based on a true story, My Mom and the Girl is a heart-warming, uplifting film that gives an unexpected and joyous look at Alzheimer's, diversity and caring. The story is based on an odd encounter that an East Coast woman (4-time Emmy winner, Valerie Harper) has one night on the capricious streets of East L.A. The former singer, now suffering from Alzheimer's, escapes after a dinner party to find her way home. With her watchful caregiver, Irlanda (Liz Torres), in tow, their brief but colorful sojourn leads to an encounter with "The Girl" (Harmony Santana), a wild character with an unexpected narrative. With a hint of danger to the proceedings, their urban adventure evolves into a funny, poignant and transformative event. One that proves to have a profoundly positive effect on three very disparate - desperate - women linked arm in arm by empathy. This film is supported by Alzheimer's Greater Los Angeles and UsAgainst Alzheimer's. 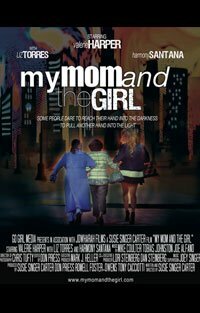 "My Mom and the Girl is touching and authentic... a beautiful vehicle for bringing much needed attention to the cause and our community of caregivers, as well as providing an important perspective on what these unsung heroes do for the people they care for 24 hours a day, every day." "It's rare when the concept of joy can be authentically connected to that most dreaded of diseases."